This luxury safari will take you to the central and western corridors of Serengeti national park, where by super luxury camps in the park offer you great nights and plates. Light air crafts transfers will be provided from one part of Serengeti to another to save time and give a wide view of the park while you are in the sky. Upon your arrival day at Kilimanjaro International Airport, our driver guide will pick you Arusha Duluti Serena lodge for dinner and overnight stay. After breakfast at Duluti Serena lodge, driver guide will take you with your packed lunch boxes heading to Kilimanjaro/Arusha airport for flight to Serengeti. After 1 hour you will reach central grass plain the Seronera region where our driver guide will pick you from airstrip ready for a game drive. 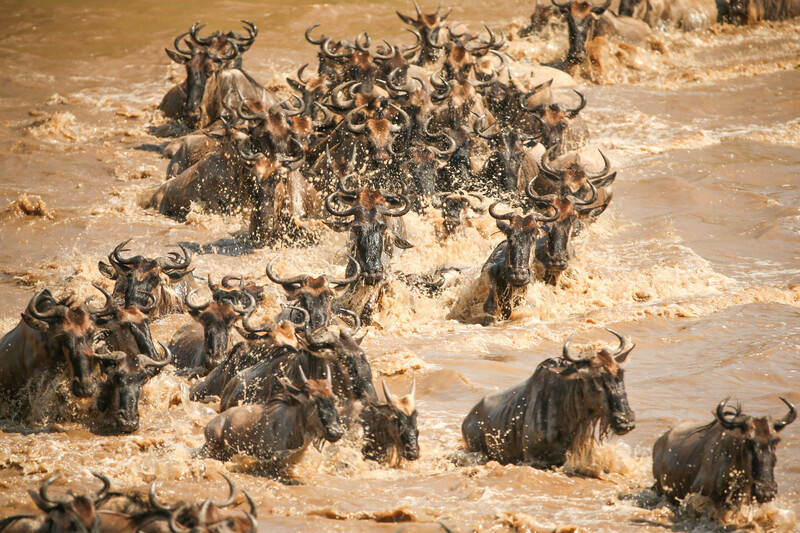 Serengeti is famed by its natural phenomena of great wildebeest migration and a large number of wilderness big cats. Other animals commonly found in the park include topi, eland, hartebeest, buffalo, elephant, caracal, serval, bat-eared fox, hyrax, genet, hares, porcupine, aardvark, giraffe, jackal, mongoose, crocodile, monitor lizard, aardwolf, many kinds of primates including baboons, vervet and colobus monkeys, and over 500 species of bird. You will reach Seronera in the afternoon, after lunch, you will explore game drive at seronera central grass land of Serengeti, in the evening you will depart to Serengeti Acacia Tented camp overnight stay. In this day early morning after breakfast at Acacia camp, our guide will drive you to explore the morning wildlife activities, and experience the ecosystem as common in the morning; predators use to chase grazers looking for food. Serengeti is famed by its natural phenomena of great wildebeest migration and a large number of wilderness big cats. Other animals commonly found in the park include topi, eland, hartebeest, buffalo, elephant, caracal, serval, bat-eared fox, hyrax, genet, hares, porcupine, aardvark, giraffe, jackal, mongoose, crocodile, monitor lizard, aardwolf, many kinds of primates including baboons, vervet and colobus monkeys, and over 500 species of bird. You will reach Seronera in the afternoon, after lunch, you will explore game drive at seronera central grass land of Serengeti, in the evening you will depart to Serengeti Acacia tented camp for dinner and overnight stay. Wake up in the morning after hot breakfast you will depart to Seronera airstrip for the flight heading to Grumeti Western Serengeti for another marvelous game drive. Have some fun memorable pictures at Seronera grass plain, before depart to the western corridor grass plains of Serengeti national park. We will cover about 80 km for 10mins through a plane. After arrival at Grumeti Airstrip, driver guide will pick you and proceed with a game drive, In the afternoon you will enjoy hot lunch at Grumeti migration camp. The Western Corridor follows the path of the Grumeti River up towards Lake Victoria. This region provides superb wildlife action in May to July, when the migrating herds cross the crocodile-infested waters of the Grumeti. In the evening you will depart to Grumeti migration camp for dinner and overnight stay. In the morning you will enjoy a hot breakfast at Migration camp, and then proceed to explore more about the great migration at the western corridor of Serengeti. The Western Corridor follows the path of the Grumeti River up towards Lake Victoria. This region provides superb wildlife action in May to July, when the migrating herds cross the crocodile-infested waters of the Grumeti. In the evening you will depart to Grumeti migration camp for dinner and overnight stay. Meal and accommodation at Grumeti migration luxury camp. In the morning after hot breakfast at Grumeti camp, driver guide will collect you to Grumeti airstrip for flight to Kilimanjaro International airport, ready for joining International plane back home. That will be the end of your luxury wilderness safari, waving farewell hands to us, Karibu Tena.